As the sun sets on another day in the quaint village, the lamps flicker on to light the way home along the rippling river. 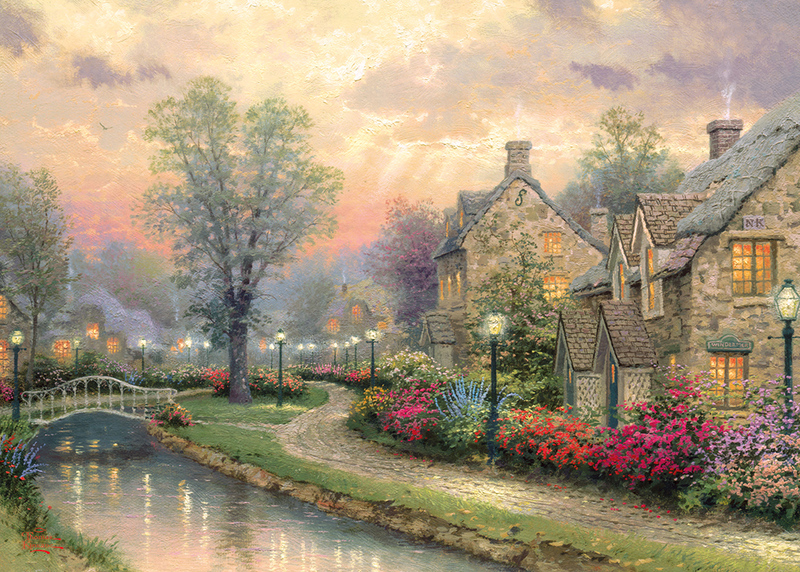 Known for his signature glowing highlights and saturated pastel colours, Thomas Kinkade painted highly idealistic American scenes that often portrayed rural and idyllic settings such as gardens, streams, stone cottages, and lighthouses, many of which that were inspired by his hometown, Placerville. As with all Gibsons jigsaws, this beautifully illustrated 1,000 piece puzzle is made from the highest quality 100% recycled board and is therefore a pleasure to work with again and again. High quality 1000 piece jigsaw puzzle. Puzzle size 48x68cm when complete. Made from thick, durable puzzle board that is 100% recycled. Gibsons jigsaws can be purchased in store from garden centres, toy shops, department stores and gift shops. Find your nearest retailer on our stockist page. Thomas Kinkade grew up in the town of Placerville, California and attended the University of California, Berkeley and the Art Centre College of Design in Pasadena. In June 1980, Kinkade spent a summer traveling across the United States with his college friend James Gurney and when the two of them finished their journey in New York they secured a contract with Guptill Publications to produce a sketching handbook. Two years later they produced The Artist's Guide to Sketching, which was one of Guptill Publications' best-sellers that year. The success of the book landed him and Gurney at Ralph Bakshi Studios creating background art for the 1983 animated feature film Fire and Ice. While working on the film, Kinkade began to explore the depiction of light and of imagined worlds and decided to earn his living as a painter.